Cuddapah is located in Andhra Pradesh state, south Central India, surrounded by the Nallamalai and Palkonda Hills and situated 8km north of the river Pennar. It is said that the name Cuddapah is derived from the Telgu word 'kadapa' meaning gate as the city acts as the gateway from the north to the sacred hill-temple of Sri Venkateswara of Tirupati. 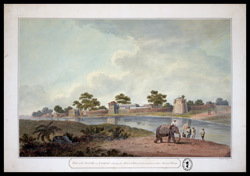 From the 11th to 15th centuries the city was part of the Chola empire. The Muslims conquered it in 1565 and the British took control in 1800.